The Geratol Net » What is the GERATOL NET? GERATOL – The Acronym. Greetings Extra Radio Amateurs Tired of Operating Lately. The group operating on the GERATOL NET is often mistaken to be a group of older hams. This is not the case. Net participants include hams of all ages, both OMs and YLs from all states and the Canadian Provinces. 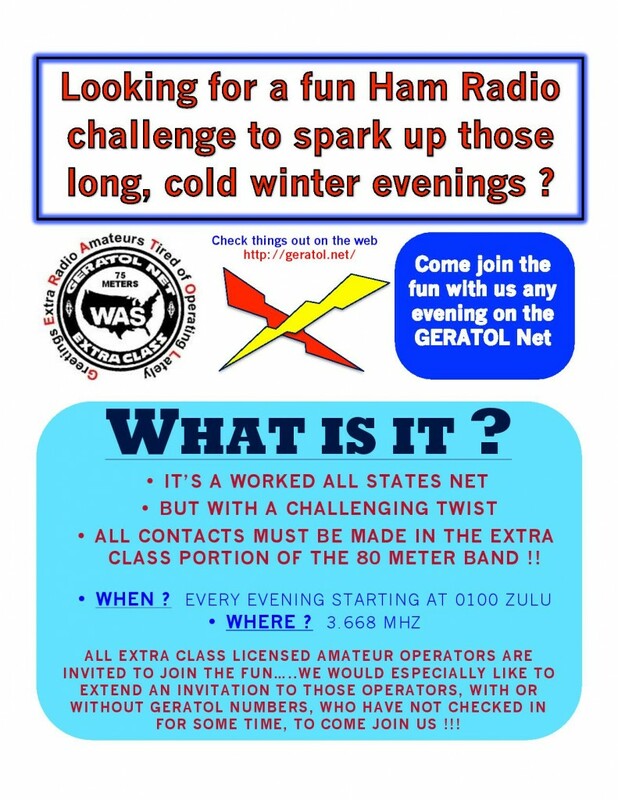 The Geratol Net is an Amateur Radio Worked All States net that meets in the 75-meter Extra class phone subband for the purpose of helping amateur radio operators obtain the special WAS award available for working all 50 U.S. states with hams holding two-letter Extra class callsigns. The award is affectionately known as the Unbelievable Operating Acheivement Award. For those earning the award, there are over 35 endorsements to pursue as well as a Directors Award. Only the basis award requires QSL cards. All endorsements are handled on an honor-system basis. The net runs it’s own QSL bureau to help those working towards the main award. The net currently meets at 3668 kHz nightly at 0100 UTC from October 1 through April 30. This site attempts to assist the net by providing information about the net and it’s awards program. More information about Amateur Radio can be found a the American Radio Relay League web site.